WEDNESDAY, April 17th, 9-10 am at The Circuit in Woodstock. Join a growing community of local support for Cherokee County entrepreneurs at the 1 Million Cups (1MC) Cherokee gathering. 1MC is always open to the public and includes free coffee! On Wednesday, April 17th from 9-10 am, we’ll launch our second Past Presenters Panel. Building a community of entrepreneurs requires that we stay connected to each other, keep learning, and follow up often. 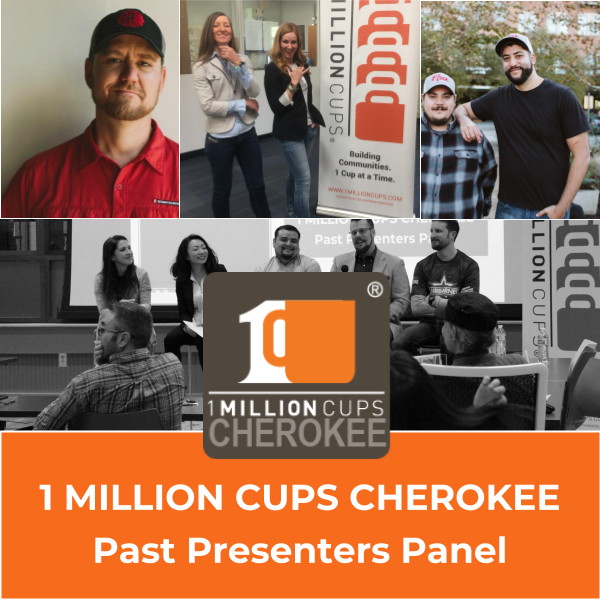 So, in the spirit of deepening the relationships of our 1 Million Cups (1MC) Cherokee community, we’re hosting our second 1MC Cherokee Past Presenters Panel this Wednesday, April 17th 9:00 – 10:00 am at The Circuit. Our previous presenting entrepreneurs (see below) will sit on a Q&A panel to give us an update since they last pitched, tell us what feedback they put into action, and share with us any past or present challenges they still need help with. It’s a way to for our entrepreneurs to stay connected and our mentors to stay updated. Join us for some coffee, community, and giving crowdsourced feedback to local Cherokee entrepreneurs. With the goal of doing these once per quarter, our 1MC Cherokee team designed these panels as a way to reconnect entrepreneurs to their community, hear update stories and lessons learned as well as continue to offer support for their new and ongoing challenges. Join us as always for good coffee, great community, and offering up crowdsourced feedback to local entrepreneurs. Help us build a culture of entrepreneurship right here in Cherokee County: Ball Ground, Canton, Holly Springs, Waleska, and Woodstock. Cherokee County is now the newest home of a national program designed to engage, educate and connect local entrepreneurs. Founded by the Kauffman Foundation, 1 Million Cups is based on the notion that entrepreneurs network and discover solutions over a million cups of coffee. The free, bi-weekly coffee gathering helps build startup communities on a grassroots level. Entrepreneurs, innovators, funders, mentors and other interested community members are invited to attend each gathering on the first and third Wednesday from 9 to 10 a.m. Led by the Cherokee Office of Economic Development and powered by their Fresh Start Cherokee brand, this local chapter, called One Million Cups Cherokee (1MC Cherokee), will be headquartered at The Circuit in Woodstock on the first Wednesday, while the third Wednesday will go on tour to a different Cherokee city each month.